Are your students bored with your class. Worse, are you bored with it? Maybe it's time to try something new, huh? After all, I had the same problem with my ESL classes for the longest time. It wasn't until I began to think a little differently that things began to turn around for me. I gave students what they wanted: games. But these weren't just any games - they were fun and also educational. Suddenly my students weren't shouting in their own language to their friends and the only reason they were out of their chairs was because they were excited. I'd be damn surprised if your students didn't react the same way when you try out these awesome ESL adventure games in your class today! Your boat has sunk and you're stuck on a deserted island. What will you do? How will you survive? Who will live and who will die? 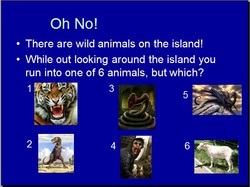 This great ESL desert island game will have your studnets coming back for more and more. Your boat has sunk and you're stuck on a deserted island. Yeah, I know, I've been here before. But last time there weren't dinosaurs and zombies! 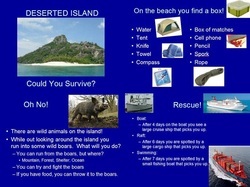 This ESL Desert Island game is even better than the first! 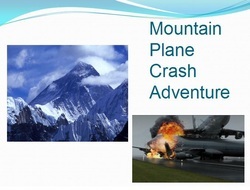 Your plane crashed into treacherous and snowy mountains. Can you work together to get off the mountain? Or will the choices you make prove your downfall? Read how to play. Don Dull leads a boring life, at least by day. At night he's Catman, the bane of Dogman and all of the dogs of Shenzhen. 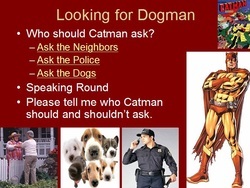 But has Dogman finally proven he can defeat Catman for good? Find out! You wake up in the desert, not knowing who you are or how you got there. You have nothing and will have to walk out. But where will you go, and what will you find? Can your students solve the mysteries of the desert, best the desert bandits, and find the key to the ancient temple? 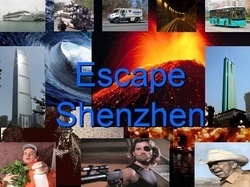 Find out with this great ESL Adventure game today! 2012 happened. Shenzhen is in ruins. Can you escape? And how will you do it? This massive ESL adventure game will keep your class busy for an hour or so. You've lost your ship, but you've still got your treasure. Can you fight your way onto another boat? And what then: bury your treasure, or go after your ship? You decide! You wake up on a train speeding out of control. No one is about and the whole place smells like death. You've got to stop this train, but how will you do it? Have your students group together and figure out this complex psychological ESL game meant for high-level students. You wanted it, I'm offering it! Yep, get all the games on this page, all 8 of them, for your class today. You'll have hundreds of slides and hours of materials. Handouts, listening pages, writing sheets, instructions, and even audio files are all included for these games. Normally this would be $12, but it's yours for a lot less. Let your class know how fun you really are - download this ESL adventure game collection right now!